Falling Waters and Nanita represent the stable when they race on Friday. Nanita is the first to go when she races in the second race at Bendigo, the 3YO Fillies Maiden Plate over 1100m where she will be ridden by Patrick Moloney and jump from barrier five. 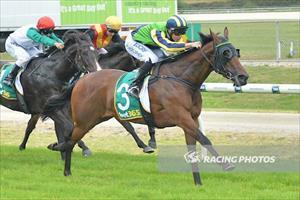 The daughter of Not A Single Doubt is racing for the second time, having finished ninth on debut at Echuca last July. ‘She’s a stronger filly this time around and her work and jumpouts have been good,” Mike Moroney said. “She does strike a strong looking race but she’s improved physically and mentally from her first preparation. Falling Waters (pictured) runs at the Moonee Valley night meeting in the last race, the Slade Bloodstock Handicap over 1000m. Falling Waters was only run down late when second at her last start at Sandown on January 31 and Moroney has elected to tackle the older mares as he felt this looked a slightly easier race than the 3YO Fillies option. “It’s still a decent field as you would expect for a city race,” Moroney said. “Ironically the two that look the main chances are also three-year-old fillies. “We haven’t done a lot with our filly - she’s only going 1000m and she looks particularly well and we’ve kept her fresh.